We’re very into charts and reward systems at our house as it simply works for our little one. She responds with glee when a tiny star is stuck to her chart in recognition for a job well done. Although she’s still a bit young to have a chore chart, I think the idea is ingenious and we’ll be introducing it when the time comes. 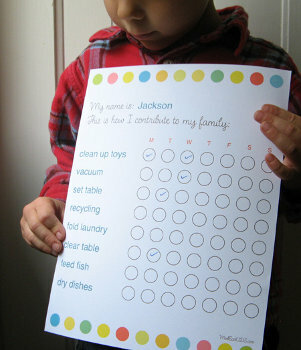 In saying this, Lisa from Sweetbeets has designed a fabulous chore chart for our older kiddies. With your child’s name at the top, a title of ‘This is how I contribute to my family’, a list of chores tailored to your family and an injection of style, the chart looks to be a winner for both parents and children. To read more about it and download a FREE copy, head to Lisa’s blog ModEco Kids.